When I started managing my employer’s Office 365 tenant in March of this year, there was no governance in place. There are some basic governance processes that are straight-forward to implement and are critical first steps in putting governance in place. I will cover each of them in a series of blog posts. This is the first in the series. Step 1. Weekly Service Change Management: Triaging the most recent week’s worth of Office 365 Admin Message Center announcements. Why? This is how you keep up with changes coming to your tenant. Is this about a security capability or security issue? Send to our CISO. Is this about a change that impacts the end user experience? Send to our Head of Training and Head of our Support Desk. Is this about a new capability or app? Send to the manager(s) in charge of aligning IT and the business so they are aware of new capabilities we can offer. Is this about a workload that is managed by a particular IT team? If it’s about Exchange or Skype, send to our Messaging team. If it’s about SharePoint, send to our SharePoint team. If it’s about PowerBI, send it to our Data Analysis team. If it’s about a tool we don’t use, for example, a trial of another service (such as Dynamics 365 in this case), remove it from the digest. Rather than forwarding the weekly digest individually to all these different parties, I just forward it to all of them, and edit the message body, adding the relevant @PersonName tags (called At Mentions) to each announcement item. At Mentions are a newer feature of Outlook 2016 and help draw a recipient’s attention to specific text in the message. Note that most of these people are not Global Tenant Admins and therefore cannot access the “More…” links in the email from o365mc@microsoft.com. What I do is copy content and the Additional Information link out of the corresponding Message Center message and into the body of the email. This way people who don’t have access to the Message Center still see the information they need to know. Link to additional information (again from message center, and reviewed for usefulness). As a final quality control step before I send out the message, I have a member of our Messaging (Exchange and Skype) administration team review my email and make sure I didn’t miss notifying anyone. Additionally, if one of the news items is something that needs to be discussed with the governance team, I make a note to bring it up in the next governance meeting. Finally, if you prefer to create and share a spreadsheet of these announcements, you can use PowerShell to create that. I tried that for a few weeks, but in the end, I found that annotating the digest email was as effective and easier for the recipients to read. Future blog posts in this series will cover reviewing the Office 365 roadmap monthly and conducting governance team meetings. This entry was posted in IT Governance, Office 365 and tagged O365 Governance by Michael Blumenthal. Bookmark the permalink. With the arrival of the Message Center Reader Role, I can now skip the step of copying in the entire message body because we can grant read-only access to anyone who needs to read Message Center. 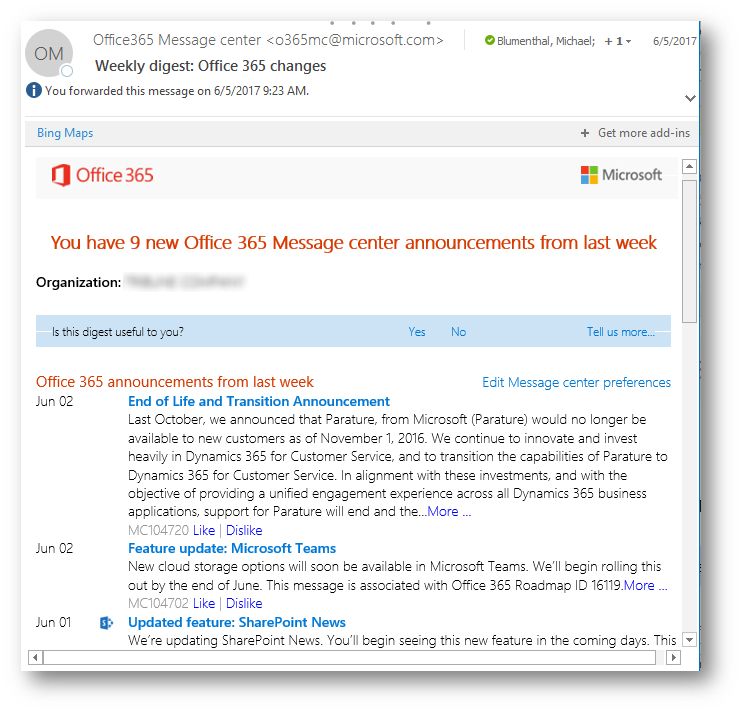 You don’t have to be an O365 Admin anymore to read message center!